For an overview of the OpenCL performances of the GeForce GTX 580, I used the benchmarking mode of GPU Caps Viewer (PRO version). 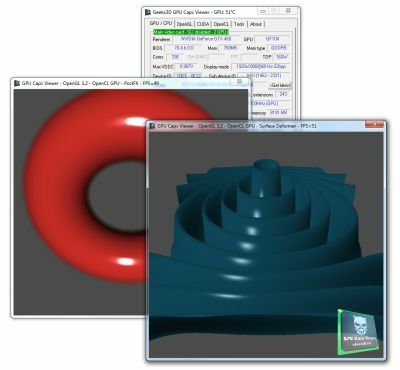 See this article for more information about GPU Caps Viewer OpenCL tests. – Surface deformer test, res: 600×600, 255×255 segments. – PostFX test, res: 600×600, global memory. – Julia4D test: crash on clBuildProgram with R262.99 (see here NVIDIA Explains Julia4D OpenCL Crash with GPU Caps Viewer).